Engineers designed the JK Jeep Wrangler to ford water up to a depth 2.5 feet. 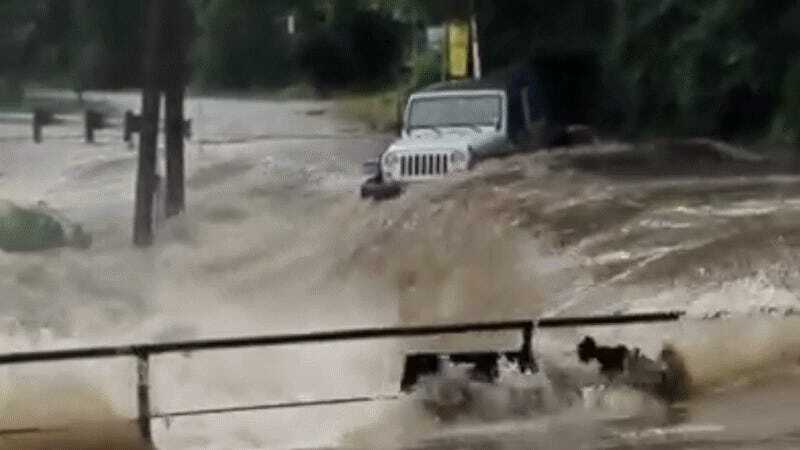 Yesterday, in New Braunfels, Texas, one Wrangler looks to have exceeded that rating big time after being swept away by a raging torrent. It was all caught on video, so if you’re a Jeep lover, prepare to weep. We don’t know much about this video, other than what’s in the Facebook video description written by Kim Jacob. Kim says a man decided to park his Jeep at the edge of a Guadalupe river crossing to check on his tent. All at once a huge wall of water came and the video shows the result. We went down into the campgrounds to tell him his Jeep was being washed away. He came and sat on the tiers in front of our house to watch it go.